We are happy to present the first inaugural issue of the Journal of Nature and Science of Medicine (JNSM) which is the official journal for the College of Medicine at King Saud University. We have great aspirations and hopes for the journal and we are confident that it would be a vessel that would carry knowledge and innovation to our readership and be of added value to the medical field at large. The college of medicine has a long history and legacy regionally and globally. First established in 1967; the college has graduated over the span of 50 years more than 5000 physicians and over 700 postgraduate trainees in different disciplines of medicine. The college has become a global leader in medical education and ranked in the top 100 medical schools globally as well as continentally in different ranking systems throughout the years. Furthermore, the graduates of the school have proven to be instrumental to health-care delivery in the country providing leaders at different levels of the health-care sector as well as education as the first postgraduate programs were established in the college prior to the establishment of the Saudi Commission of Health Specialties (SCFHS), and the leadership for the SCFHS has been from the faculty of the college over the years. The scientific publications from the college of medicine have seen a significant increase in quantity as well as quality over the years and when measured by impact would be in the forefront of institutions in the region. This is due to the deep understanding of the researchers of the needs of the community and conducting research that is diverse from basic sciences to translational medicine to research that is epidemiological in nature. More recently, an innovation unit within the college has started to flourish guided by a mature leadership with clear goals and ambitions and that has embraced newer enthusiastic generations of physicians. 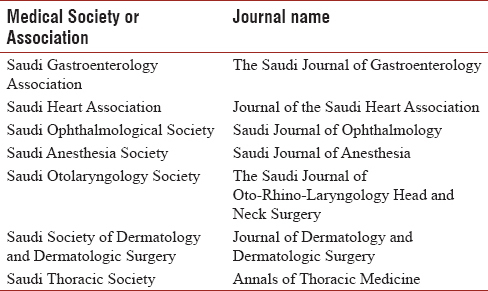 In addition, the college faculty have been founders of multiple scientific societies that played a major role in shaping the health-care system in the country; a number of these societies have journals that are focused in their disciplines [Table 1]. This most recent addition to the journals of the college is meant to be inclusive of multiple disciplines and would focus on translational research as well as interdisciplinary scientific work. We strive for the JNSM to be a platform for researchers to intertwine and view challenges to the health-care systems in different prisms whether it is medical education-, health policy-, public health-, or disease-related research. We believe that the breadth of the JNSM would be inspiring for researchers to tackle their areas of interest from different angles and possibly foster some interdisciplinary research and collaboration on a regional and hopefully international level. Leveraging on the experience of the current leadership of the journal as well as the faculty of the college, we are confident that the journal will be successful in achieving its goals and promoting research that is meaningful and of value to the community and the advancement of science. We also believe in the value of disseminating knowledge and having access to a broad spectrum of readers; thus, we embraced an open access system. We also have trust in our readership to help us cater to their needs and we would be eager to have feedback that would help us gear our focus and improve the quality of the manuscripts submitted to the journal and would encourage them to submit their valued work or to voice their opinions or share their experiences in the form of letters to the editor or short communications. This journal has been imagined by a few, initiated by the believers, and would be carried forward by those who are passionate.